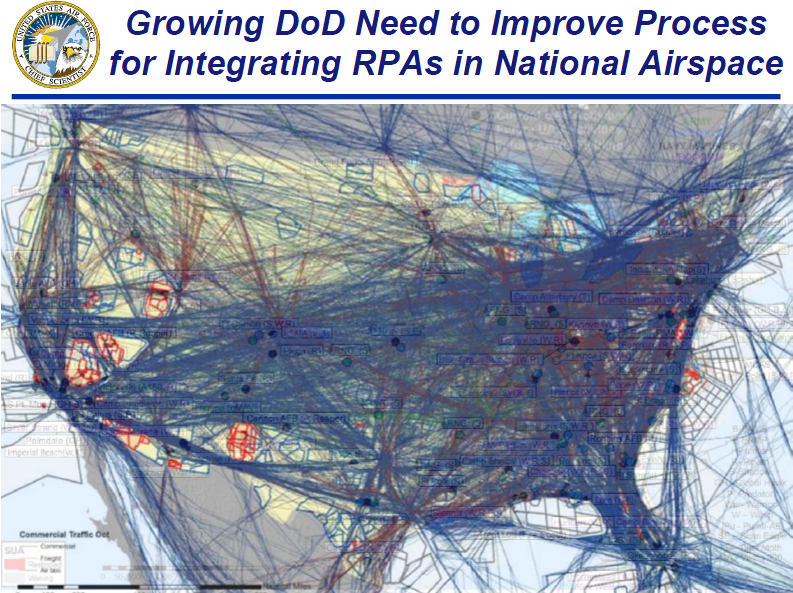 A map of current military remotely piloted aircraft (RPA) operations as of 2011 is presented with an overlay of flight paths through the national airspace in a U.S. Air Force Chief Scientist presentation. Most of the public discussion surrounding the use of drones both internationally and domestically has focused on issues of privacy or civilian casualties. Due to the technical complexity of drone operations, there has been little media examination of the practical feasibility of widespread domestic drone deployment. In February, the FAA Reauthorization Act of 2012 was signed into law clearing the way for more than 30,000 domestic drones by 2020. The law requires the FAA to create procedures for commercially-operated drones by 2015 and enables law enforcement agencies to operate small-scale drones at low altitudes. While this has a number of negative implications for the right to privacy, such as the lack of any laws governing the usage of data collected via drones, the thought of a future where U.S. skies are filled with an array of drones has a much larger, more practical problem: is it even logistically possible to operate thousands of pilot-less aircraft in the domestic airspace? The first set of problems that will likely plague any attempt at the widespread use of drones inside the U.S. relate to frequency allocation and electromagnetic interference (EMI). In order to be controlled from a remote location, drones must communicate via with a ground control station via some sort of data link. In order for this link to be maintained, there must be protection against electromagnetic interference that can disrupt the communications link. If the interference is sufficient in scale, it can lead to what is called a lost link event causing the drone to lose contact with its operator. Sometimes the link is reestablished and the pilot is able to maintain control of the drone. Sometimes the link cannot be reestablished and the drone is effectively turned into a zombie that can drift far from its intended target, as may have occurred recently with the RQ-170 captured by Iran in December 2011. 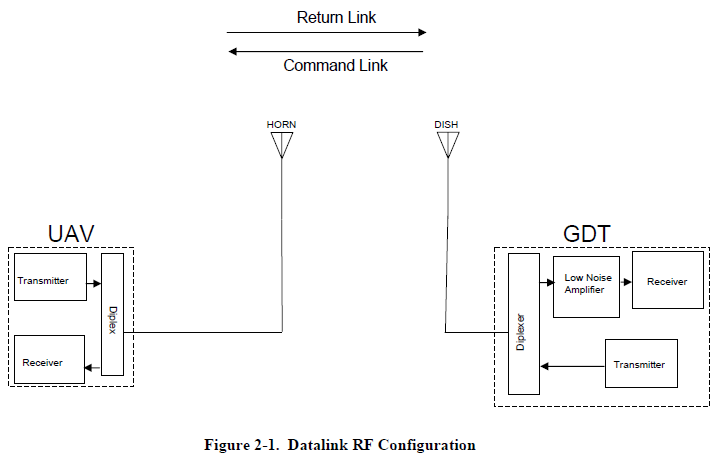 A diagram of the data link between a drone and its ground data terminal (GDT). The data transmitted through the GDT is sent to a ground control station (GCS) where the drone pilot operates the unmanned aircraft. Finding unallocated frequencies that can be used for drone aircraft can also be a difficult task. For example, when the Department of Defense’s Joint Spectrum Center analyzed the deployment of Predator B drones in 2004 along a section of the Mexico-Arizona border, they conducted extensive analysis of the potential for electromagnetic interference and other frequency disruptions. The report examines potential conflicts between Mexican fixed microwave links, National Science Foundation radio astronomy observatories and various other potential sources of interference. When several Predator drones were needed for tests at Creech Air Force Base in Nevada, the Joint Spectrum Center had to study the potential for interaction with residential indoor and industrial outdoor radio local area networks, outdoor video surveillance networks and other potential signals arising from a nearby residential community. The second set of problems facing domestic drones center around their ability to avoid collisions both in the air and with objects on the ground. Current military drone operations in places like Afghanistan, Pakistan, Somalia and Yemen occur in an airspace environment that is relatively unoccupied. There is not a tremendous amount of air traffic in Somalia, for example, or Yemen and the terrain is largely devoid of high-rise buildings and other grounded objects that could create impediments to small-scale drone operations. Yet, even in these environments, avoiding collisions and deconflicting airspace is a major concern for drone operators. 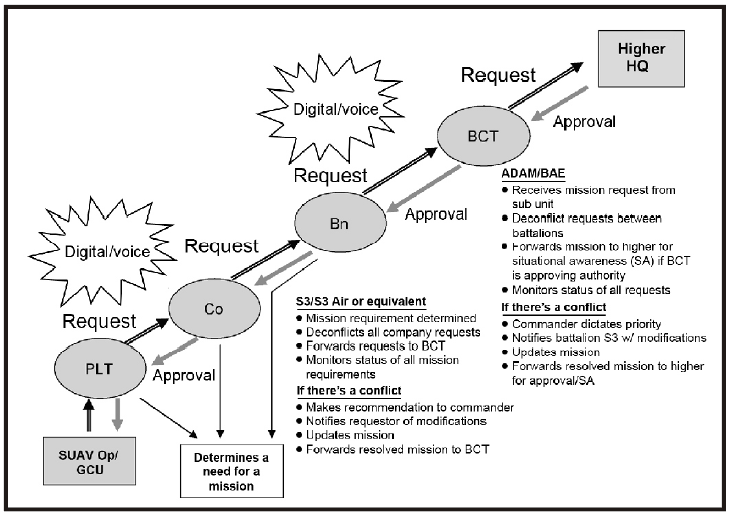 A diagram of the small unmanned aerial vehicle (SUAV) mission planning process as presented in a U.S. Army manual. The FAA’s own website makes it clear that due to drones’ “inability to comply with ‘sense and avoid’ rules, a ground observer or an accompanying ‘chase’ aircraft must maintain visual contact with the UAS and serve as its ‘eyes’ when operating outside of airspace that is restricted from other users.” A 2011 presentation from the U.S. Air Force Chief Scientist acknowledges this need for increased integration of domestic drone operations into the national airspace, as well as improvement in collision avoidance systems capable of surviving “lost-link” events where the drone loses contact with its ground control station. The potential for mid-air collisions has already caused problems for domestic drone operations in Hawaii, where the state purchased a $70,000 drone to monitor Honolulu Harbor without the knowledge that FAA approval would be required to operate the device. When the FAA analyzed the case, they found that traffic from Honolulu International Airport and a nearby Air Force base made operating the drone too dangerous and denied the state’s request. Situations like this will likely arise with greater frequency as the push toward domestic drone operations is continued in the U.S. and other Western countries.